How do you go about creating a space to support collaboration, problem-solving and innovation? These key considerations will help get your digital message across more effectively. 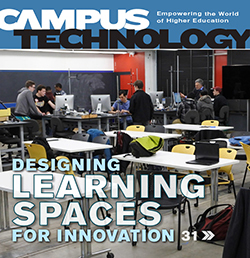 Soon, students could be interacting with content on immersive head-mounted displays. Understanding project stakeholders and processes is key to better management of AV installations. Issuing a request for proposal that gets the response you need starts with refining your RFP process. It's possible to embed accessibility into the course creation process, without too much time or effort. How the University of Maryland University College became the largest institution in the country to go "commando" on textbooks. Login / What Counts as Learning While Making? C-Level View / E-Portfolio: The LMS for Students?